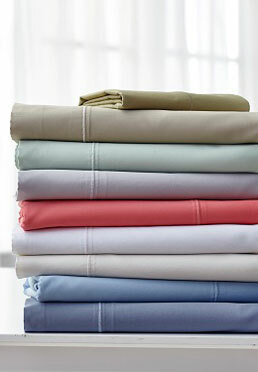 This Egyptian cotton sheet set combines high-quality comfort with an ultra-smooth softness and feel. The sheets feature Flexi Fit® panels that allow the fitted sheet to fit snugly on your mattress from 8-in. to 18-in. thick. Engineered to resist fading wash after wash, while drying faster than conventional sets, this collection makes a practical and rich addition to any bedroom.